Are Eurosceptic Tories really ready to move against May? 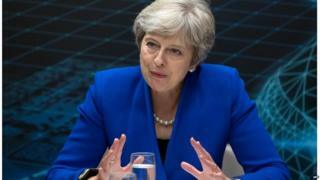 As the BBC has been reporting, conversations about how and when to remove Theresa May took place with deadly seriousness last night among a group of Eurosceptic MPs. However senior voices in the European Research Group - yes them - are adamant that it is not the time to try to oust the PM. It would be "stupid", one told me last night. Right now those jostling to remove her know they don't have any guarantees they would have the numbers to force her out, even though they may well be able to pull together enough MPs to submit letters to the chair of 1922 committee to trigger a contest. So are the Eurosceptics coldly gaming the options for how to get their way? Does that include discussing if, when and how, they could try to push the prime minister out of office? Absolutely. But does it mean we are on the verge of a coup being launched against Number 10? Things can change very fast these days. But don't be so sure.